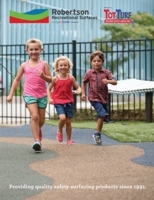 Robertson Recreational Surfaces, makers of Tot Turf Rubber Surfacing, offers a wide variety of surfacing for playground and recreational areas that meet the Americans with Disabilities Act and the Consumer Product Safety Commission requirements. We provide surfacing solutions through innovation in industry compliant products and services, customer education, and superior service. Robertson is also proud to offer maintenance programs and compliance solutions to keep your playground meeting ASTM playground standards. Robertson is a PlayCore Company. PlayCore helps build stronger communities around the world by advancing play through research, education, and partnerships. Our company infuses this learning into its complete family of brands. We combine best-in-class planning and education programs with the most comprehensive array of recreation products available to create play solutions that match the unique needs of each community we serve. Backed by our experienced sales team, highly trained installation teams, maintenance programs, and excellent customer service, Robertson Recreational Surfaces provides you the peace of mind and professional expertise you deserve when working with a surfacing company. Check out our catalog for just a peak at what we can do for your space!